An early McIntosh type released by the New Jersey Agricultural Experiment Station in 1971, hence the name. This is one of the most successful results from a continuing effort to produce an apple with an earlier ripening date with similar qualities to the McIntosh. Tart and tender it is an early favourite. Eating quality is quite good. 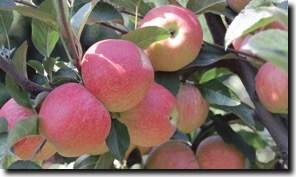 Jersey Mac is a good choice for McIntosh lovers who are getting impatient waiting for the Macs to ripen. With it’s medium size and beautiful appearance it has a lot of appeal to children making it another good choice for school lunches. 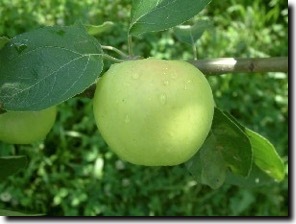 An early yellow apple ripening the first week of July. 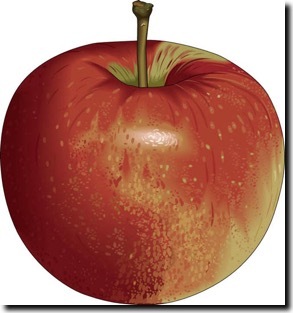 The fruit is tender, juicy and midly acid, making it a favourite for homemade applesauce. Attractive, high quality, yellow washed with crimson fruit. Very white, firm, crisp, sweet flesh. A sweet subacid flavour.